Rabbit anti Human, Mouse TP53BP1. A synthetic peptide, which represented a portion of human tumor protein p53-binding protein 1 encoded in exon 11, 12 and 19 (LocusLink ID 7158). This antibody is a cocktail hybrid of NB 100-304 and NB 100-305. P53-binding protein 1 (53BP1) plays a critical role in tumor suppression and is a putative substrate of ATM kinase. Upon DNA damage, it is phosphorylated and relocalizes to the presumptive sites of damage, specifically, double-strand breaks. This also suggests a role in DNA repair, maintaining genomic stability. Yanagawa T, Funasaka T, Tsutsumi S, Hu H, Watanabe H, Raz A. Regulation of phosphoglucose isomerase/autocrine motility factor activities by the poly(ADP-ribose) polymerase family-14. Cancer Res. 2007 Sep 15;67(18):8682-9. PubMed PMID: 17875708. 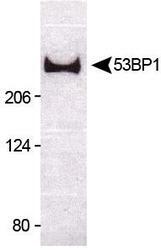 NB100-904 is specific for human 53BP1 protein.